Neil Gaiman is a preternaturally gifted storyteller, that rare talent who is both prolific and profound. He constructs fantastic stories that somehow ring true, mainly because he is so good at creating indelible characters, focusing less on the dry arcana that bogs down most fantasy tales. He is also a master of dramatic economy, unlike Stephen King, whose books are so full of bloat that they are almost always improved by tearing out every other page. I became a fan of Gaiman when a friend pressed a copy of American Gods into my hands, although I do remember appreciating his Sandman comics years ago. Ever since the apotheosis of Hilary Clinton as a Presidential candidate, the phrase "it takes a village" has become a pop-culture truism, a platitude signalling the importance of strong community bonds in the rearing of children. In an imaginative twist on this idea, Neil Gaiman's The Graveyard Book tells the story of Nobody "Bod" Owens, a boy literally raised by a graveyard. How this comes to pass is told swiftly in the first chapter in a harrowing scene that explains the fates of Nobody's parents and sister as he, an infant, accidentally crawls away from a murderous pursuer by entering the titular graveyard and by somehow being rescued by the ghosts that haunt it. Despite its implausible and other-worldly elements, Gaiman manages to make this opening scene both suspenseful and sentimental by focusing on how the universal impulse to protect babies apparently carries even beyond death. Seven more chapters (and an interlude) follow, detailing Nobody's tutelage in the ways of both the graveyard and the surrounding world, and Gaiman proves to have an excellent feel for weaving popular and folkloric elements into his story, so that the supernatural seems to vividly co-exist with the actually historic to make Nobody's environment lush and palpable. This is a book that teems with not just ghosts from various epochs of human history but all sorts of creatures of the night. Though Nobody is surrounded by fanciful entities (including witches, werewolves and ghouls), his conversations with them are realistic, even naturalistic, in tone, and, through these interactions, we see Nobody slowly but surely approach adulthood. At one point, the boy even attempts to attend a local school, but the results are calamitous. He's a precocious and thoughtful child, but I guess he would have to be, given where he's grown up. 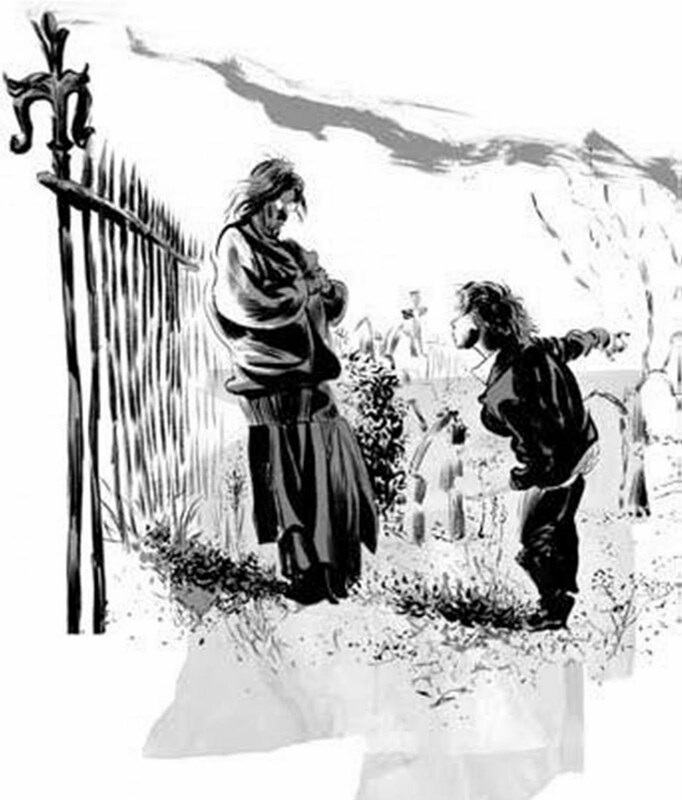 The Graveyard Book is a story that begins with several murders and is largely set amongst the dead, but the tone Gaiman strikes is anything but morbid. In much of the book, it's downright cheery, as it's clear that Nobody is being kept safe, so long as he stays within the confines of the graveyard. The ghosts, for all their ectoplasmic wispiness, become genuinely affectionate towards their little orphan. I especially enjoyed Nobody's conversations with Silas, his undead guardian, an imperturbable and droll advisor. 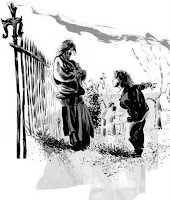 Even Dave McKean's grayscale illustrations, while dark, are somewhat comical in tone, reminding me of the drawings that accompanied my first tastes of Dickens. It's an apt reminder, as The Graveyard Book has a distinctly classic British flavor. And I mean that in a good way. But we all know that, to grow up, one must venture forth, and, as Nobody begins to navigate the world outside the graveyard, his own past comes back with a vengeance. Following the mid-book interlude, the plot seems to gather steam, which makes sense. Nobody has entered adolescence and has begun to yearn for things his cozy graveyard cannot afford him. And then an old friend and an old nemesis reappear. It should be noted that The Graveyard Book is marketed as a children's book and that Neil Gaiman was awarded a Newbery Medal for it in 2009. This award recognizes "distinguished contribution to literature for children" and this book, for all its trappings of the macabre, is just that. But it also won the Hugo for best novel of 2009, which is an award that recognizes achievement in science-fiction or fantasy. So, clearly, with The Graveyard Book, Neil Gaiman has crafted a story for all ages -- and he's got the trophies to prove it. The Graveyard Book is certainly NOT a trite coming of age tale. Gaiman's twists on the connections between life and death make this a fresh adventure for young and old.